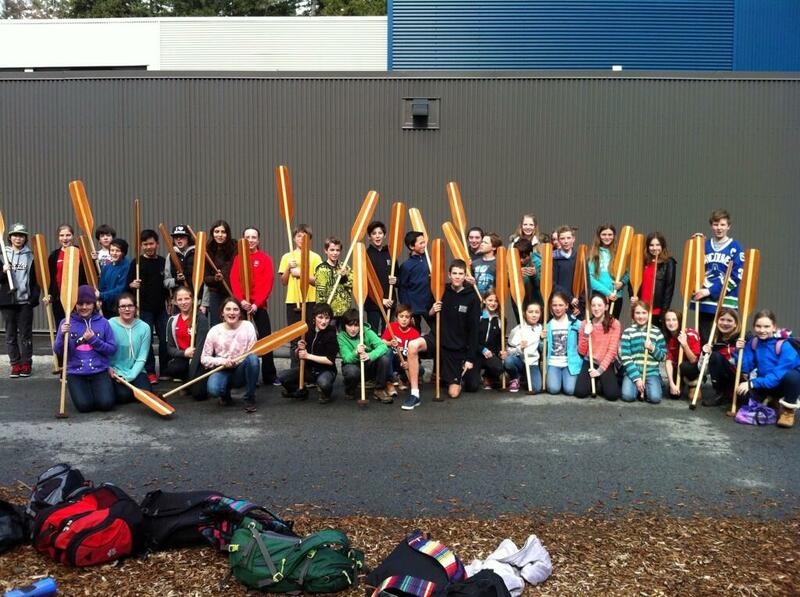 Just before Spring Break, students in outside45 built canoe paddles under the guidance of Ian Magrath, master craftsman and husband of BICS teacher Laura Magrath. Students were visibly and justifiably proud of their creations: They understood that their paddle was unique because of their efforts in shaping it and they appreciated the aesthetic and practical value of their paddles. It was evident to me that students planned to keep their paddles for a lifetime. I can think of few other material things for which this is true. It occurred to me that people typically keep what they make and I began to think about how true this is of learning. In transactional learning, students do not simply adopt the knowledge of the transmitter but construct their own meaning through seeking various perspectives, problem solving, as well as considering their experiences to draw their own conclusions and develop understandings. In transformational learning, the learning experience may shape the student’s perspective on a topic or even their worldview and transform the way they approach and synthesize future learning. I have described these three approaches in more detail here. In October 2013, the BC Ministry of Education released a new Draft Curriculum[ii] for Kindergarten to Grade 9 for most elementary and middle school subjects. The curriculum is organized in such a way that teachers and students can connect learning from subject to subject and from grade to grade in a way where students can construct a story of their learning. The new curriculum is organized around four to six “big ideas” for each subject in each grade. In some cases, the big ideas are the same or very similar across many grades. Big ideas, according to the Ministry of Education, are “statements that are central to one’s understanding in an area of learning. A big idea is broad and abstract. It contains two or more key concepts. It is generally timeless and is transferable to other situations.” I have shared one big idea in the Science curriculum from Kindergarten to Grade 7. Kindergarten The basic needs of plants and animals are observable through their features. Grade One Living things have features and behaviours that help them survive. Grade Two All living things have a life cycle that includes birth, growth, reproduction, and death. Grade Three Classification organizes diverse organisms into groups based on their characteristics. Grade Four Living things sense and respond to stimuli in their environment. Grade Five Living things are comprised of cells, tissues, organs, and organ systems. Grade Six Multicellular organisms rely on internal systems to survive and interact with their environment. Grade Seven The theory of evolution by natural selection provides an explanation for the diversity of living things. The scope and sequence of these big ideas allows students to develop increasingly complex understandings of living things, from observation of features to a theory on how they adapted these features. As noted above, big ideas are timeless and transferable to other situations so that the learning in Kindergarten Science can be related to learning in other subjects. Imagine a student learning about the Social Studies Grade Five big idea: “The development of natural resources has shaped the economy of different regions of Canada.” By observing the resources humans extract, students learn about the current needs and wants of humans that these resources fulfill. This understanding can be linked to the big idea in Kindergarten Science: “The basic needs of plants and animals are observable through their features.” In Kindergarten, the needs are observable through the organism’s features; in Grade Five, the basic and not-so-basic needs and wants of humans are observable through their resources. Through these connections, big ideas allow learners to deeply understand concepts rather than try to memorize a broad array of content. In my experience both as a teacher and learner, people do well at retaining and making connections with their understandings of concepts but content is more easily forgotten. In this way, big ideas – developed with content knowledge – are useful for future learning; unstructured content far less so. Teachers and learners are less likely to connect discrete information from subject to subject and from grade to grade. But it is possible to connect big ideas – there are only 4-6 per subject for each grade – to other subjects horizontally and other grades vertically. This creates an opportunity for teachers and schools to help students think holistically about a topic, and in great depth. There will be no guide for teachers to follow in connecting curriculum from one subject to another and one grade to another. The curriculum is left intentionally open-ended so that learning, while focused and purposeful, can be personalized and contextualized to schools, classrooms, and students. After all, the intent is for students, with structure and guidance, to construct their own understandings of big ideas and connect their understandings to other areas of the curriculum and their lives beyond school. It will be the job of educators and students to not only understand the big ideas of their subjects and current grade, but to understand how these big ideas relate to different subjects in different grades as well as life beyond school. Doing so is complex work but it is also a great opportunity to connect learning so that students can construct their understanding of the world, and who they are in it. [ii] For a narrated tour of the online draft curriculum, click here.